Since breaking through in 2010 with their debut album Good Ol’ Fashioned Love, The Overtones have established themselves as the leading UK vocal harmony group. Since that release the group has released another 4 studio albums, including 2015’s festive collection Good Ol’ Fashioned Christmas. They’ve also toured the UK pretty exhaustively, regularly pulling large crowds and selling out shows up and down the country. Earlier this year, the group suffered the tragic loss of member Timmy Matley causing them to cancel a slew of shows. After taking time to grieve for their band member, The Overtones made the decision to continue as a four-piece. They announced a new self-titled album, the follow-up to 2015’s Sweet Soul Music, and a headline tour for later in the year. The first taster from the record was a cover of Barry White’s You to Me Are Everything and fans heard what the group sounded like without Matley’s voice in the mix. It’s fair to say that Matley had one of the best voices in the group, and he definitely had the largest range, so does The Overtones still work as a four-piece? In short, the answer is a resounding yes. Matley’s voice is greatly missed, although his last recorded vocal does appear on Will You Still Love Me Tomorrow?, but the other four members – Darren Everest, Mike Crawshaw, Mark Franks and Lockie Chapman – have worked out how to use their voices in the best way to fill the gap Matley has left. The album opens with Say a Little Prayer, which sees Lockie taking the lead. His warm, deep tone suits the song perfectly while the other three members of the group provide gorgeous harmonies. As is to be expected, the vocals are shared more with the group members throughout The Overtones. With each album they’ve released, the reliance on Timmy and Lockie to lead has loosened and it’s a pleasure to hear Darren, Mike and Mark’s voices. You to Me Are Everything opens with Mike before making way for the rest of the band to take a turn on lead. Every member of the group is a capable singer and it’s nice to hear their voices in isolation. One moment I didn’t think would work but it actually does, is the group’s cover of the Spice Girls number one Goodbye. Stripping the pop production of the original down to piano, the group come together for one of the most emotional moments on the record. The poignancy of the lyrics and the passion in the vocals combine to provide a perfect tribute to Matley. It caught me a little off guard and it’s one of the standout moments. Stand Up and By My Side are the two original songs on the record, which the group had a hand in writing. Stand Up is reminiscent of the sounds the group explored on their first two albums and By My Side is an emotional piano ballad. I’m still hoping for an album of fully original material in the future as they are gifted songwriters and their originals are always incredibly strong. Elsewhere on the record The Overtones go acoustic for a stunning rendition of My Girl, ring the festive bells on Rockin’ Robin and embrace their Motown influences on Love Really Hurts Without You. The album comes to a close with the gentle disco feel of Love is in the Air, which won’t fail to get you grooving and singing along. 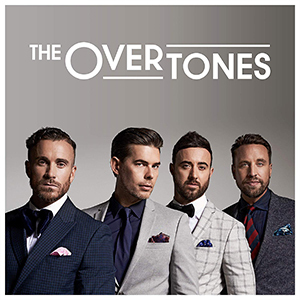 This can’t have been an easy album for The Overtones to make but they’ve pulled it off. Matley would be incredibly proud of the record and I couldn’t help but hear his voice at certain moments throughout the record. The group’s fans will be very happy with the album and I really do hope they continue on as a foursome. What they have is something no other group in the UK has right now and in a world that brings perpetual bad news, it’s nice to have something that can give you a break and put a big smile on your face.